This issue of Kronos is dedicated to Terry Flynn, assistant curator at the Ann Bryant Art Gallery, who was instrumental in the successful installing of 'Red Assembly' there in 2015. Friend, colleague, artist and inspiration. Hamba Kahle. The work that emerged from the encounter with Red, an art installation by Simon Gush and his collaborators, in the workshop 'Red Assembly', held in East London in August 2015, is assembled here in Kronos, the journal of southern African histories based at the University of the Western Cape, and previously in parallax, the cultural studies journal based at the University of Leeds published in May 2016. What is presented there and here is not simply more work, work that follows, or even additional works. Rather, it is the work that arises as a response to a question that structured our entire project: does Red, now also installed in these two journals, have the potential to call the discourse of history into question? This article responds to this question through several pairings: theft - gift; copy - rights; time - history; kronos - chronos. Here we identify a reversal in this installation of the gift into the commodity, and another with regard to conventional historical narratives which privilege the search for sources and origins. A difference between (the historian's search for) origination and (the artist's) originality becomes visible in a conversation between and over the historic and the artistic that does not simply try to rescue History by means of the work of art. It is in this sense that we invite the displacements, detours, and paths made possible through Simon Gush's Red, the 'Red Assembly' workshop and the work/gift of installation and parallaxing. To gesture beyond 'histories' is the provocation to which art is neither cause nor effect. Thinking with the work of art, that is, grasping thought in the working of art, has extended the sense of history's limit and the way the limit of history is installed. What to do at this limit, at the transgressive encounter between saying yes and no to history, remains the challenge. It is the very challenge of what insistently remains. 'It is our hope that the work presented here might constitute a beginning to what might be thought in the time of the after of colonialism. Onward therefore, from parallax to Kronos, and the work that remains'.1 It was with these words that we ended our introductory essay to the special April-June 2016 issue of parallax, the 'provocative cultural studies journal' based at the University of Leeds in the United Kingdom.2 In that issue, titled East London Calling, we published a selection of articles from the workshop 'Red Assembly: Time and Work' convened around Simon Gush's installation, Red, held at the Ann Bryant Gallery in East London, South Africa in August 2015. What we were not able to publish in that parallax introduction, because we had not secured permission from the copyright holder before the publication deadline, was a stanza from the lyrics of the song 'London Calling' by the rock band The Clash which had provided the inspiration for our musings. As we now publish a second set of articles from 'Red Assembly' in Kronos, a journal based at the Centre for Humanities Research and the History Department at University of the Western Cape in South Africa that promotes 'innovative historical research about southern Africa' and that is particularly interested in 'integrating visual and textual sources',4 we are responding to the call from London not to 'look to us' but to instead think about the work that remains from the vantage point of the 'faraway towns' - Cape Town and East London. This work is more difficult than it seems. For it is not simply more work, work that follows from Red Assembly: East London Calling, or even additional works. Rather, it is the work that arises as a responsibility in the face of what remains. Because this responsibility comes to bear on the task of both breaking off and continuing on, it points to an ambivalence that structures our entire project. As Freud insisted in Totem and Taboo, Ambivalenz is not about holding different views of the same object. It is about both hating and loving the Urvater - the forefather/originator/progenitor.5 It is about holding opposing views of, in our case, the discourse or discipline of history. On the one hand, our work here is pursued in a context defined by a deliberate effort to theoretically pressure, even stun history with the work of art. On the same hand, the work that remains unfolds here in a mode of writing largely, if reluctantly faithful to the generic protocols of Western historiography. It does so not to luxuriate in paradox, but to foreground the problem that cannot be factored out of any effort to protect what remains from devolving into the remainder, from devolving into an archive where what survives of our various encounters with Red is bound. In this peculiar sense the two journals assembled around 'Red Assembly' are marked by the parallax that names one of them. Their writings, their views, helps protect what Derrida calls le reste from becoming yet another thing to be indexed on the list of things. Working in this yes and no, in this no history and yes more history, is keeping faith with remains, however difficult. Given the rigours imposed by the structuring of our work, we feel obliged to consider an apparently disparate time and space to coincide with the publication of the special issue of parallax, Red Assembly: East London Calling. On 14 May 2016, an article appeared in East London's Daily Dispatch reporting, under the banner headline 'GRAND THEFT AUTO', that 'Mercs worth R4-m' had been stolen off the dock below the Mercedes-Benz plant on the Buffalo River in East London.10 Six 'boys' from 'the underworld'11 - 'thieves posing as employees of a local vehicle logistics company' - stole three luxury Mercedes-Benz vehicles from the East London harbour. Three of the six were in 'work uniform'. 'Only the three people who were wearing uniforms were allowed to take three vehicles,' a police spokeswoman said.12 A photograph from the newspaper's image archive of the massive container ship Glorious Leader in dock accompanied the story in the Daily Dispatch - even though this particular freighter was not in fact in the port at the time of the theft. Used as an illustration for, or copy of another, by-then-departed ship, it became an image of a generic atemporal space that was simply inserted into the newspaper's otherwise historical account of the theft. The discourse of journalism would appear to have discovered in this instance the very perplexities that are under scrutiny here - precisely in relation to an image. Why else would one find this story tagged under the sign of a video game, GRAND THEFT AUTO? The Steve Biko Bridge, across the Buffalo River, affords a view of the dock from which the cars were stolen. The dock and the bridge are often dwarfed by ships like Glorious Leader that come up the river to load the cars that are lined up like 'bars of soap'13 below the Mercedes-Benz plant on the edge of the river, where, in 1990, autoworkers built a (red) car for Nelson Mandela after his release from prison, and soon thereafter, went on a wildcat strike. 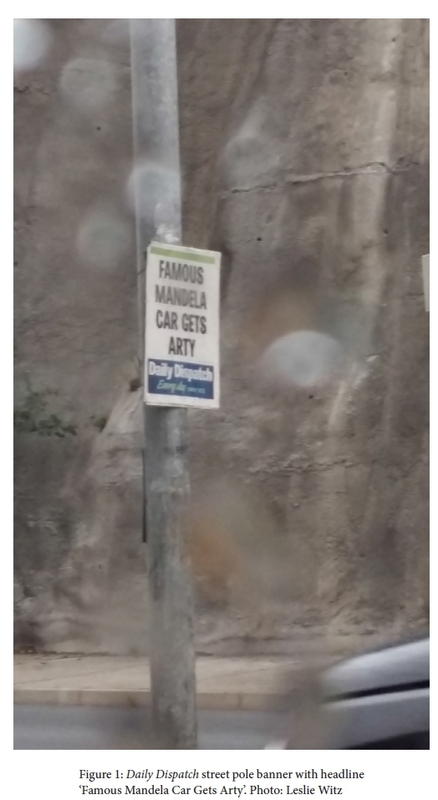 Twenty-five years later, in August of 2015, a Daily Dispatch newspaper poster on that bridge brought together event, installation and workshop with the banner headline 'Famous Mandela Car Gets Arty'. Pared down to an eye grab, the words on this poster flatten a complex, dispersed set of events around the gift of the red Mercedes for Mandela (and the subsequent strike at the Mercedes plant in the same year) to a simple catchphrase. In a single rhetorical flourish the implied weight of history is followed by the lightness of art, naming a distinction between history as the real and art as representational. And yet, the press release sent to the Daily Dispatch by the workshop organisers called this ordering into question, announcing that '"Red Assembly" revolves around the question of what it would mean to place [the] work of art at the centre of an historical reading'.14 In keeping with this reversal, the 'Red Assembly' workshop in East London did not start with the recounting of historical events - the making of the red Mercedes or the wildcat strike at the Mercedes-Benz plant that followed. Rather, it was called into being by a work of art and yet another theft. The work of art,Simon Gush's Red, an installation initially staged at the Goethe Institute in Johannesburg (March 2014), was constituted around estranged reconstructions of the Mercedes car body, strike uniforms (by local designer Mokotjo Mohulo) and beds. These were objects of, but not from, the incident.15 A film (made with James Cairns) was a central part of the installation. It fabricates the story of the events of 1990 through interviews with representatives from management and labour, and by editing these with evocative video footage of contemporary East London, marked by an almost photographic stillness (see Corinne Kratz, Tom Wolfe, Patricia Hayes and Simon Gush). We invited participants in 'Red Assembly' to respond to the different forms of expression invoked by the installation (film, photography, sculpture, oral and written text, sound/the acoustic, even critique). The idea was to initiate a discussion around time, work and art that would return us to questions of how particular subjectivities (racial, gendered, classed) are established and contested in the modern social. How do we move predictably and unpredictably - as art workers, historians, curators, activists, laborers - between assemblages of the aesthetic, the political, the social, the real, the spatial, the modern and, yes, the historical? 'Every new event in a story alters the events that generated it'17 and the installation Red is an event in this story too, as was our encounter with it, first in Johannesburg, then on the Internet, and then just over a year later, at 'Red Assembly' in East London, where the story arguably began or began again. At the workshop itself, participants were asked not merely to read their papers or reiterate their key arguments but also to reflect on their more immediate encounter with the installation, its images, soundscapes and texts. In these engagements with the work, in the writing of the papers at the time, and in their later elaboration for inclusion in the two differently positioned journals, we need to ask how much was actually disrupted, how productive it has been to place the work of art at the centre of a historical reading without merely instrumentalising it as a way to rescue history. Put differently, have we avoided the founding ambivalence of the project, or otherwise failed to put it to work? The signs were auspicious. To not render 'Red Assembly' a simple point of departure, it was crucial to emphasise its dislocation of time and history by grasping this effect as put in play by a theft, not just of a vehicle from the East London dockyard, but from a monastery in Venice almost 220 years before Red assembled in East London. On 11 September 1797 Napoleon Bonaparte, whose armies had taken control of Venice, ordered the removal from the monastery at San Giorgio Maggiore of a painting by Paolo Veronese, The Wedding at Cana. So what started on 11 September 1797 in Venice, or perhaps even when Veronese painted The Wedding at Cana in 1562/3 - or even earlier, most likely some time at the end of the first century, when an oral tradition (or a mythological tale) of turning water into wine was inscribed into a text known as the Gospel of John - had, by some un-reconstructable set of circumstances, led to the opening of Red and 'Red Assembly' at the Ann Bryant Gallery in East London. The itinerary of our thinking had taken us (and not necessarily in this order) from a theft in Venice (1797), to a red Mercedes and a strike at a motor car assembly plant in East London, South Africa (1990), a colloquium in a monastery in Venice (2007), an exhibition called Red with different iterations in Johannesburg, Cape Town, Port Elizabeth and Grahamstown, and East London (2014-15), a workshop titled 'Red Assembly' (2015), and soon thereafter to another theft, this time from the dockyard in East London in the absent gaze of the Glorious Leader (2016). Theft here is more than something that set other things in motion; it is the effect of the dislocation that gestured to us from within the work of art. As we noted in the introduction to the journal parallax, 'one might read the move from "Red Assembly" to Red Assembly: East London Calling in … parallax merely as yet another stop in the itinerary of Red.' And there is the temptation to make this special issue of Kronos merely another stop in this itinerary, so that the articles presented here, in this journal, subtitled since 2008 Southern African Histories, will simply contribute to the dubious and problematical sense that 'History is just one damned thing after another'.22 But instead of repeating or reenacting history, and by deliberately placing parallax, the journal in the North, and Kronos, the journal in the South, into contact with each other, we hope to continue the work of probing how the new 'lines of sight' afforded by Red coax us into perspectives that are 'unpredictable and indeterminate, contingent and creative'.23 Are we writing from where we think we are? And when, where and how will a reading take place? The 'small but significant' may not seem like much. But consider that the demand for the return of one's suns might usefully be understood to represent a wrinkle, a fold, in what the 'history' of science - as represented, for example, by Thomas Kuhn - has taken to be the 'revolution,' the 'rupture' represented by Copernicus', then scandalous heliocentric assertions. Indeed, heliocentrism is, quite apart from its theological and astrophysical implications, certainly one way to think the history of history as divided between something modern and something less so. Recall that Freud, in The Introductory Lectures of Psychoanalysis from 1916, used Copernicus (but also Darwin) to frame for his audience the historical significance of psychoanalysis as the completion of the Copernican revolution and its founding outrage against human narcissism, epitomised by Ptolemy who placed the earth at the center of the universe.27 Thrown into relief here, if only in passing, is the fact that both Ptolemy and Copernicus believed in a centre, they just disagreed about its location. To multiply suns and distribute them across all the nights and days that wander across the face of the planet is something altogether different. Among its many effects is its exposure of the troubling tie between time and history, a tie that loses touch with what remains in the reminder of the distinction between history and time. But there are stories of Cronus (sometimes called Kronos) that are not about the universality of time as a progression. These are stories from Greek and Roman mythology that are about acts of castration in order to usurp an established order and also, once power has been seized, to prevent further challenges by consuming one's offspring: Cronus overthrowing and castrating his father Uranus, in turn eating his children who were potential rivals, his son Zeus being secreted away, surviving and in turn overthrowing Cronus, then taking power and imprisoning Cronus and perhaps castrating him as well. There are shifting versions of these stories, with aspects sometimes being suppressed and others highlighted, and claims and cautions to a wrongful conflation of two separate figures, Chronos as the image of time, and Cronus as attempting to wield and maintain power. To tell of Cronus (rather than Chronos) is to embellish narratives with conflict and guile. It is to speak of attempts to manipulate time, of the rearrangement of the time of succession, and struggles over the setting in place and disruption of sequences. Although he attempts to reach further back or under, Freud's global positioning of the Urvater, the founding figure of Ambivalenz is rather plainly gesticulating from the sidelines of this war zone. But even as we set such a narrative in place we worry over its claims, pathways, ruptures, beginnings, endings and selections. As we have attempted to think and work with the idea of Cronus we have implacably returned to the universal empire of time in Chronos. If there is anything that the film that forms part of Red alerts us to, it is to processes of narrativisation, contextual disjunctures and futures that are never foretold (see Witz and Rassool). Its aural and visual vocabulary constantly jar (Pyper, Hayes, Chávez Mac Gregor and Mtshemla/Minkley/Pohlandt-McCormick), enabling connections, contexts and juxtapositions, but then in the same gesture disrupting them (Kratz). There are openings to parallax views, lines of flight, readings and misreadings from the installation of Red into race and hunting, queer studies and museum construction (Vig, James, Smith and Witz). Perhaps a way to think about possibilities of rupture in Kronos is to go to two editions which we have totally left out of the story we have told thus far and whose front covers do not fit into any of the patterns which we claimed as identifiable. They are what was called the pre-millennium issue of Kronos, number 25 of 1998/99, and the following year's edition. They both had somewhat bizarre covers. On the brown-beige front cover of number 25, with a brick wall as background wallpapering, is a sepia toned photograph of Cape Town in the late nineteenth century: 'The YMCA Building adjacent to "Het Gesticht" in Long Street Cape Town (1884)'. The back cover features a rather indistinct photograph dated ninety years later of some young boys walking down a street with what might be apartment blocks in the background and the framework of a building under construction. This is identified as 'Dutch Reformed Mission Church, Kasselsvlei, Bellville (1974)'.41 Whether this is a reference to an archival source or a location in the photograph is unclear. Issue 26 has an even more unusual cover. It is in midnight blue and the title Kronos appears four times in lime-yellow lettering, cascading and fading in and out horizontally across the cover. A possible visual reference and similarity might be to the monochrome computer monitors of the 1980s. Although one of us was a co-editor of these issues of Kronos, there is no recollection of the reasons for the choice of these cover designs and photographs. They were as arbitrary then as they appear to us now. But there is also a second claim. We feel compelled to assert a prior moment of a parallel publication with Kronos, in this instance with the journal History and Theory. In the latter a selection of papers that had been presented at South African Historical Society conference held at UWC from 11-14 July 1999 were published. Given the same title as the conference '"Not Telling": Secrecy, Lies, and History', this special issue of History and Theory suggested that not only are the dichotomies between telling and not telling, truths and fictions, secrecy and divulging not so clear cut, but that they continually work with and constitute each other. Rather than taking up the position of doing history through the recovery of the telling (the fundamental assumption of oral histories, for instance, but also, as Hayden White insisted long ago, the fundamental drive toward emplotment),50 what was perhaps more important was understanding the not-telling: how both 'secrets and lies are produced, represented, and re-presented in public and private grammars of "not telling"'. This, the editors Gary Minkley and Martin Legassick said, might actually 'tell more'.51 And although the editors told us that the papers selected were those that 'pertained to the concerns of History and Theory most effectively' and had a 'South African content', while at the same time developing 'more general points about secrecy, lies, and history', there was no telling why some of the papers from the conference instead found their way into Kronos 26, alongside some other papers.52 That 'not telling' can be read in several ways: it could be that History and Theory and Kronos were understood to constitute different publics; it could have been an issue of the timing of publication; and, much less generously, it could be a reading that (inadvertently perhaps) saw Kronos as being just a diminished copy of the international publication in the North. We want to resist following the last suggestion. Instead we want to argue that, in this instance of parallel publication, a precedent was set that we are following, a precedent of international co-publication, of opening up the reading with and against each other, of establishing parallax views. If Kronos 26 was already calling to those of us marked by the encounter with Red, this is because it had already thematised the dilemma and provocation of what remains beyond and before any remainder. This is the deep significance of its challenge to nationalist narratives, of unsettling the comfort zones of history as a profession and breaking down the foundations of disciplinary knowledge. Whether or not the publication of some of the papers from 'Secrecy and Lies' in History and Theory, published in the North, constituted a mere theft or an appropriation will have to remain open to conjecture here. Not because something left out may later be found, but because what is left in remains illegible, at least for the foreseeable future; that is, for the future history expects to encounter. Whether a distribution of the good(s) tends to leave the South with the dregs, perpetuating the development of underdevelopment even in the production of know-ledge, and whether such is the nature of the postcolonial, is something no one struck by the task of saying yes and no to history can avoid. After all, the discipline of history would appear to align itself with those discourses, such as anthropology or sociology, now thought to data mine in 'the fields' of their operations, and to 'gift' their partisans or adherents with the intellectual property (including, of course, careers and spheres of professional influence) generated by such mining. It is here that a return to the curious and vexing problem of our need to obtain copyright permission for the use of a few lines from the Clash's 'London Calling' may prove suggestive. It allows us, once again via the work of art and the work of history, to reflect upon the relationship between theft, the gift, and the copy. In this reading they are invoked, respectively through: Veronese's painting, The Wedding at Cana; the GRAND THEFT AUTO of the Mercedes from the East London docks; the gift of the red Mercedes for Nelson Mandela; the creation and return of the facsimile of The Wedding at Cana to the monastery at San Giorgio Maggiore, and the building of Simon Gush's red Mercedes. In her essay in parallax, Red Assembly: East London Calling, Paige Sweet noted the proliferation of legal instruments and technologies to mark and demarcate intellectual and artistic property/ownership, prohibiting the direct copying of 'cultural goods' and especially song lyrics.54 This is justified, rightly so, through the invocation of the original artist's rights, but often and in keeping with capitalism's logic, always already captured by producers and production companies. From this perspective, many cultural goods are put out of reach of direct copying, which often increases the ways in which they are copied creatively, indirectly.55 Scholars and others for whom those cultural goods were intended (or who were the consumers of those cultural goods) have had to employ more creative, indirect means to use such materials - in our case through footnotes reference or citation (see parallax) - which has arguably, and ironically, diminished the power of the original work of art. This creativity is also evident in all of the articles presented here in Kronos. Thinking the theft, the gift and the copy together here in Kronos makes visible a curious reversal, one in which publishing companies, highly capitalised purveyors of the knowledge produced in the academy - the product of intellectual labour not directly paid for (in most cases) - have also become the arbitrators of, and deflected the responsibility for, costly and burdensome procurement/securing of permissions onto the author. Ironically, without the intellectual production of the author, the product - the journal - would not exist. Materially, authors only indirectly 'profit' from the deals those publishing companies have made with universities and university libraries in the age of the declining profitability of hard-copy journals and as a result of the rise of electronic publication, a gesture of digital enfranchisement that promised without delivering a democratisation of knowledge production. In the US, academic publishing is only indirectly linked to advancement and financial gain for its authors through the system of promotion and annual review, while in South Africa, (article) publication is at the heart of a system of government subsidies for research at universities. The relative standing, both financially and institutionally, of universities in the North v. those in the South - with universities in the South not as well resourced to shoulder the cost or leverage combined funds to acquire expensive journal bundles - also means that the digitisation and economisation (to freely use Wendy Brown's concept: 'the conversion of non-economic domains, activities and subjects into economic ones'57) of journals further aggravates historic and geographic knowledge divides and access. University libraries, and therefore students and researchers, in the South are rarely able to afford the full slate of up-to-date journals in any given field that their counterparts in the North have access to, and are constantly requested to review lists so they can be pared down to essential data bases. Sweet has suggested that the way writers (and especially historians) 'have dealt with reference suggests an anxiety about originality and authority endemic to the already-written (or the already-made)'. Once this anxiety translates to publishing houses and their concerns for transferring the care of copyright to authors in the interest of averting the costs associated with copyright, that 'anxiety about originality and authority' becomes commoditised. The path that Sweet lays out for the red Mercedes, 'from the commodity to the gift' for Mandela, is inverted to one in which the gift is turned into a commodity.58 But this is what prompted us to ask: Is history, precisely in its empiricist, quantitative drive, not posing as a copy? Is the discipline of history not a bid for ownership of this copy? While individual articles do not explicitly address each of these entanglements - although some do - the introductions here and in parallax attempt to bring out more clearly what the installation of Red, 'Red Assembly' and the work of the contributors in the medium of the journal has prompted us to think. There are many lines of flight such thought might follow, but here we have thought with four, grouped into pairs: theft - gift; copy - rights; time - history; Kronos - Chronos. And we have thought by way of parallaxing and installation, bringing these notions into new relationships with each other. We identified above a reversal in this installation of the gift into the commodity. A second reversal is the one enabled via the theft, the gift and the copy with regard to conventional historical narratives which privilege the search for sources and origins. Instead, a difference between (the historian's search for) origination and (the artist's) originality59 becomes visible in a conversation (and the invocation of vision and sound here is deliberate) between and over the historic and the artistic that does not simply try to rescue History by means of the work of art. It is in this sense that we have invited the displacements, detours, 'curious paths, assemblies/(dis)assemblies, 'impossible'60 copies of the work presented here, and made possible through Simon Gush's Red, the 'Red Assembly' workshop and the work/gift of installation and parallaxing. Does Red, now installed also in these two journals, have the potential to call the question of history into question? To gesture beyond 'histories' was the provocation to which art is neither cause nor effect. But thinking with the work of art, that is, grasping thought in the working of art, has extended the sense of history's limit and the way the limit of history is installed. What to do at this limit, at the transgressive encounter between saying yes and no to history, remains the challenge. It is the very challenge of what insistently remains. Red Assembly built upon a set of institutional and intellectual relationships between the Flagship on Critical Thought in African Humanities, the Centre for Humanities Research (CHR) at the University of the Western Cape, the Department of Science and Technology/National Research Foundation (NRF) SARChI Chair in Social Change at the University of Fort Hare, and their collaborators. The latter included the African Programme in Museum and Heritage Studies, the African Critical Inquiry Programme (a partnership with the Laney Graduate School of Emory University in Atlanta, Georgia, with funding from the Ivan Karp and Corinne Kratz Fund) and the University of Minnesota Interdisciplinary Center for the Study of Global Change, all of whom we thank for their support. In addition, we want to thank the Andrew W Mellon Foundation, the African Critical Inquiry Programme and the NRF for their funding across various platforms that contributed to the workshop and the publications in parallax and Kronos. The views expressed here are not attributable to any of these funders. Of course 'Red Assembly' in all its forms would all not have been possible without the openness and willingness of Simon Gush to share his work with us and to subject it to such intense scrutiny. Last, but certainly far from least, we wish to acknowledge the steady heat put under the posteriors of editors and contributors alike by the extraordinarily generous readers who gifted us all with the example of what it means to nurture thinking. 2 parallax, 79 (April-June 2016), inside back cover. 4 These words appear in the front matter of all editions of Kronos from Number 32, November 2006. 8 Hayes and Bank, 'Introduction', 6. As is evident, this introduction by Hayes and Bank is tremendously generative for us in our formulations. Aspects of these initial ideas, amongst others, are elaborated upon in a forthcoming publication, Ambivalence, a selection of essays edited by Patricia Hayes and Gary Minkley on photography and visibility in African history. 11 The Clash, 'London Calling'. 12 Daily Dispatch, 'GRAND THEFT AUTO: Thieves drive off dock with Mercs worth R4-m', 14 May 2016. 14 'Red Assembly - Time and Work, Ann Bryant Art Gallery, 27-29 August 2015', press release, University of Fort Hare, 4 August 2015. 15 Gush asserts that the reconstructions 'are not historically accurate, but imagine the possibilities of moments when the factory was appropriated for alternative ideas of what production might be.' Simon Gush: http://www.simongush.net/red/. 16 From Letters of Invitation to 'Red Assembly', 2015. 17 Powers, 'Saving the Best Wine for Last', 163. 18 P. Gagliardi, 'Prologue. The return of The Wedding at Cana to the monastery of San Giorgio Maggiore' in Gagliardi et al, Coping with the Past, viii. 19 In 1803 Napoleon renamed the Louvre after himself as Musée Napoléon. See A. McClellan, Inventing the Louvre (Berkeley: UCLA Press, 1994). 23 Pohlandt-McCormick et al, 'Red Assembly: East London Calling', 126. 24 Iziko South African National Gallery, February to September 2015, http://www.iziko.org.za/calendar/event/william-kentridge-the-refusal-of-time, last accessed 3 December 2016. 25 Although found in Shakespeare, the homonym between sun and son, to which we will return, achieves a fresh pertinence here. The suns for whose return Kentridge is calling, are also the sons (and daughters) subjected to the Atlantic slave trade. A scant four blocks Northwest of the gallery in which 'The Refusal of Time' was installed stands the Slave Lodge. Even the faintest sensitivity to the logics of postcoloniality would cause this homonym to boom or keen across the Company Gardens that articulate the Iziko complex of museums. Bringing these sons back would bring back the times violently eclipsed by slavery. Do we dare? We warmly thank Maurits van Bever Donker for having put his degree in English Literature to such spectacular use. 29 This draws heavily on our introduction to the parallax special issue, East London Calling. 31 Pohlandt-McCormick et al, 'Red Assembly: East London Calling', 128. 33 J.L. Hattingh, H.F. Heese' H.C. Bredekamp and J. Joubert, 'Van die redaksie' ('From the Editors'), Kronos: ń geleentheidspublikasie van die Wes-Kaaplandse Instituut vir Historiese Navorsing, 1, 1979, 1-2. 36 Editorial, Kronos, 17, 1990, 1. 37 That exception was Helen Bradford and Msokoli Qotole's piece, 'Ingxoxo enkulu NgoNongqawuse (A Great Debate about Nongqawuse's Era), which was a reproduction and translation, with an introduction, of a series of articles on the Xhosa cattle-killing by William Gqoba in the newspaper Isigidimi SamaXosa in the 1880s. Kronos, 34, 2008, 66-105. 38 Front matter, Kronos 34, 2008. 39 'Future of the Past' was the title of a conference held at UWC from 10-12 July 1996, co-hosted by the History Department and the Mayibuye Centre for History and Culture. It was 'fraught with tensions, heated debate and sharp disagreements'. See Leslie Witz and Ciraj Rassool, 'Making Histories', Kronos 34, 2008, 6. 40 Witz and Rassool, 'Making Histories', 15. 41 Front Matter, Kronos, 25, 1998 /1999. 53 W. Shakespeare, Hamlet, Scene 1, Act 2, line 67. - full attribution is given. 55 Sweet, 'The Renewed Work', 155. 56 Pohlandt-McCormick et al, 'East London Calling', 127. 57 W. Brown, 'Sacrificial Citizenship: Neoliberalism, Human Capital, and Austerity Politics', Constellations, 23, 1, 2016, 3. 58 Sweet, 'The Renewed Work', 155.